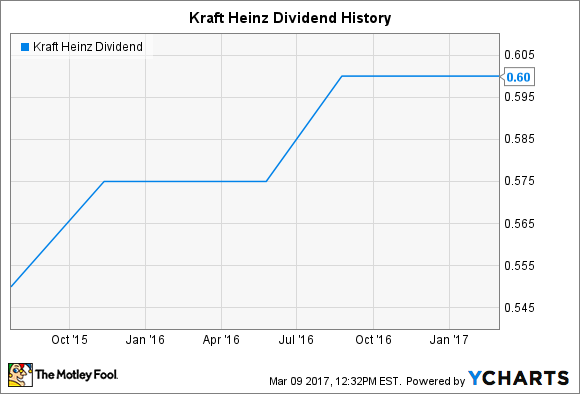 Kraft Heinz Dividend History: Can the Food Giant Keep Paying Investors More? The newly combined Kraft and Heinz continue to treat shareholders well. Kraft Heinz (NASDAQ:KHC) has only existed in its current form for a couple of years, but the recently merged entity has a long history dating back for decades. The combination of Kraft Foods and Heinz created a massive food company that has plenty of well-known brand favorites among consumers, and the company has retained its predecessor components' commitment to dividend payments for its shareholders. Now, investors want to know what they can expect from the company going forward, and a look at Kraft Heinz's dividend history should shed some light on what the future is likely to bring. Kraft and Heinz joined forces in 2015, and since then, the company has been good about making regular increases to its dividend payout. After starting out at $0.55 per share, the company has made two increases to its quarterly payment, one in late 2015 and the other in mid-2016. The boosts amounted to 4% to 5% each and have helped keep the stock's dividend yield stable at between 2.5% and 3%. KHC Dividend data by YCharts. Yet when you look back to the dividend legacies that the two companies brought to the merger, you get a more complete picture of what their dividend policies actually were. Heinz was actually a Dividend Aristocrat for more than a decade until it reduced its dividend in 2003, and since then, the food company had been back on the right track, with consistent increases in its dividend dating back to 2004. For Kraft's part, it was itself a spinoff from Mondelez International (NASDAQ:MDLZ), and Mondelez put together an attractive track record of dividend growth that dates back to the early 2000s. The aftermath of the financial crisis led Mondelez to keep its dividend flat for a while after successive annual increases, but what the complete picture tells is that both Kraft and Heinz have the history of commitment to dividends that they have both carried forward into their merged business. Still, one challenge that Kraft Heinz has faced recently is that its earnings haven't grown as much as investors would have liked. Consumer giants like Kraft Heinz often pay a relatively large portion of their earnings to shareholders as dividends, especially if they believe that the prospects for investing capital internally back into their businesses doesn't make sense in such a mature industry. In that light, the company's payout ratio of 80% to 85% isn't all that extreme. Moreover, with Kraft Heinz having eliminated a commitment to pay dividends on previously issued preferred stock, that payout ratio has fallen toward the 65% range on a current and going-forward basis. What's next for Kraft Heinz's dividend history? In the near future, Kraft Heinz has identified getting its balance sheet healthier as a core priority for the business. With a relatively high leverage ratio, the food giant is looking to use free cash flow in large part to reduce debt to more manageable levels over the long haul. That will have the impact of diverting some money that could otherwise be used to produce dividend growth, but it will also reduce interest expense and potentially put Kraft Heinz into an even better position to grow dividends in future years. That said, the food industry is competitive, and headwinds could slow Kraft Heinz's progress toward improving its financial strength. That in turn could make future dividend increases slower than investors would like. But with a big vote of confidence from Warren Buffett as a major stakeholder, Kraft Heinz looks like it's poised to keep delivering solid dividends in the future. Income investors can appreciate the boring but beautiful business that Kraft Heinz has put together. With good current dividends and prospects for future growth, Kraft Heinz's dividend history is just getting started for those who appreciate investments that produce income.